Here is our last week of Signs, Superstitions, and Omens! If you happened to miss the past two installments, you can find them HERE and HERE. I hope that y'all have enjoyed this last week of SSOs. I've enjoyed reading the ones some of you have shared in the comments here and over on the Appalachian Mountain Roots Facebook page! 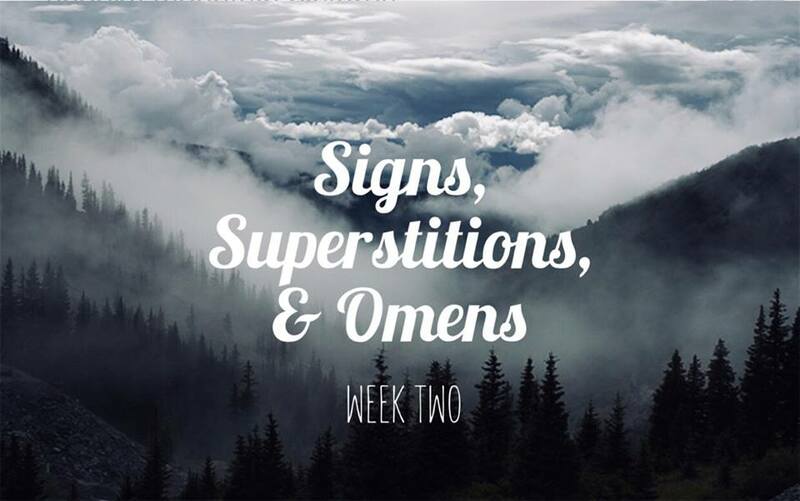 It's time for our next installment of signs, superstitions and omens! If you missed last week's you can CLICK HERE to catch up. signs do not foretell negative happenings. Two blackbirds flying together is a sign of good fortune. If a person's medicine has been spilled accidentally, it is a sign that he will soon recover. A bee that flies into the house is a sign that a stranger is coming. If a chair falls over as a person rises from the table, it is a sign that the person is a liar. It's a sign of good luck when your right eye itches. If you leave a piece of tin on top of an ant's nest during the full moon it will turn to silver. You should not was a baby's right hand for its first three days or life or you will wash all of it's luck away. If a coal miner washes his back right before going to work, the mine roof will collapse on him. If a picture falls off a wall for no apparent reason, it is an omen of a coming catastrophe. It is an omen of an extremely hard winter ahead if several plants come into bloom out of season. See a butterfly at night? It is an omen of unexpected death. A candle that has been put out but continues to glow is an omen of misfortune. If a rooster crows as you leave to go on a trip, it is an omen of trouble. As the diversely ethnic settlers came into the Appalachian region, a detailed system of folklore was developed by combining signs, superstitions, omens, music, stories and beliefs. This system was passed down orally through the years and practiced as a way of keeping the folklore alive. I've heard many of these stories and beliefs while growing up and while I would not consider myself a superstitious person, the possible outcomes of not abiding by these rituals will inevitably worm its way into my mind. Better safe than sorry, right? Over the next few weeks, I plan on sharing some of these signs, superstitions, and omens and hope that you will be willing to share any that have been passed on in your families and communities. Tingling or itching ears are a sign that someone is talking about you. If it is the left ear, you're being gossiped about. If the right, good things are being said. Sole of your foot itching? This is a sign that you are about to embark on a long journey. If you have a candle that is hard to light, it is a sign that rain is on the way. Dreaming of bees is a sign of good fortune. An acorn placed on a window will will protect the house from lightning strikes. Treading on an ant nest will cause rain that day. Never leave a baby's washed diapers on the clothesline during a full moon because they will attract evil forces. A chicken laying an uneven number of eggs is an omen of danger. If a rabbit crosses your path before sunrise, unhappiness will cloud your day. If the dough for baking bread cracks while being shaped, a funeral will occur soon. If a broom falls over for no reason when someone walks past, it is an omen of bad fortune. Calling out the name of a deceased person while dreaming is an omen of a death. 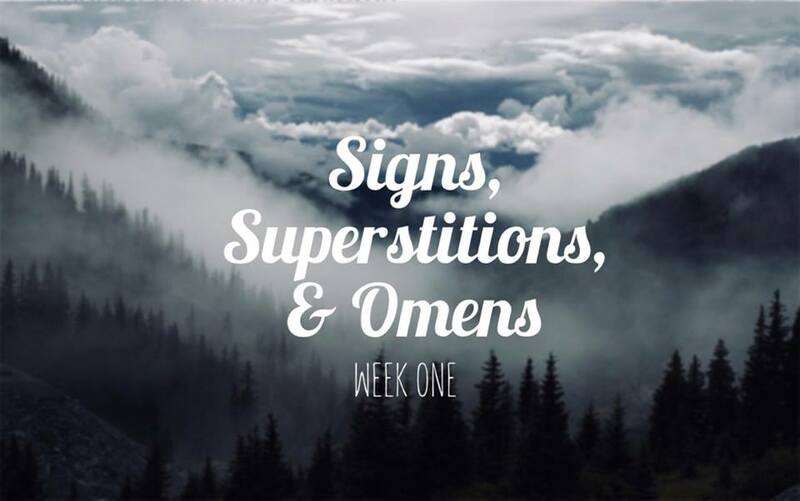 I would love to hear any of the signs, superstitions, and omens that are a part of your families or communities. Feel free to share in the comments section below or you can send me a message on the Appalachian Mountain Roots Facebook page. I love fall. The fruits and veggies are canned and on the shelves. The leaves are just starting to put on their last glorious display before saying goodbye. And the cooler temperatures have FINALLY arrived in my little part of Appalachia! That's western NC for those of you who are new to Appalachian Mountain Roots. As much as I enjoy this season I can't help but wonder what kind of winter we can expect this year. Sure, I could read extensive scientific predictions from all of the "experts" but we both know that they don't really know any more than us plain folks. 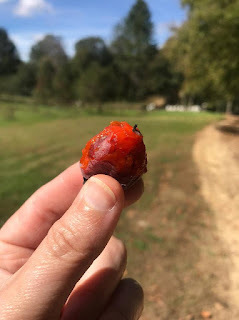 SO, I did what any country person does if they want to find out...I found me a persimmon tree! Lucky for me we have a persimmon tree out at our old place and drove out to pick some Saturday afternoon. Most people wait until after the first frost to pick them but we found a couple that were already REALLY ripe. My father-in-law's honeybees were not happy that we were invading their territory so we grabbed a few that we could easily reach and skidaddled back to the car! The deer and turkeys have left us with slim pickings! I thought to take a picture. It was delicious! Looks like spoons to us! That means we can expect plenty of snow to shovel (spoon). We did have a couple that looked like a knife which means cold, "cutting" winds. Had there been a fork shape in the seeds we would have had a mild winter with some light, powdery snows. I love snow so that might be part of the reason most of these looked like spoons to me. I think we see what we want to sometimes. I realized that I didn't know a whole lot about persimmons so I decided to read up on them. 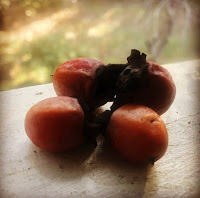 This is what I found in Foxfire 3: "Persimmons are very high in food energy. The leaves, rich in Vitamin C, can be used for tea." 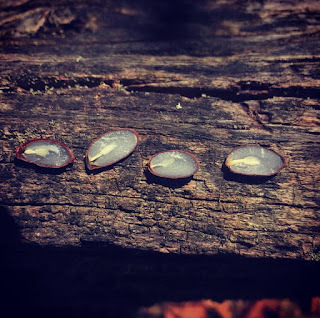 The book, Folk Medicine In Southern Appalachia, says that persimmon juice on the tooth and gums is good for a toothache and for an earache, "A green piece of hickory or persimmon wood was thrown on a fire, and the sap emitted during burning was collected in a saucer and poured into the ear." I guess only time will tell if the persimmon seed prediction is true or not. Like I said, I love snow so I'm hoping it's right! Have you peeked into any seeds this year? 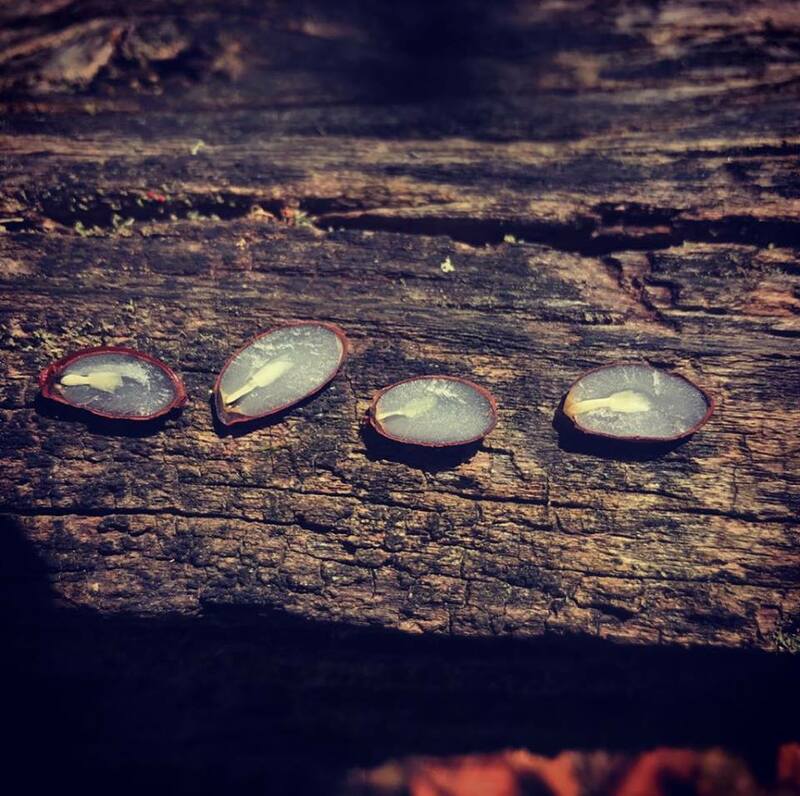 What do the seeds say in your neck of the woods? You can leave a comment below and let me know! In my family, if someone is sick you feed them. Someone died? You feed their family. Someone just had a baby? You feed them. Food is the answer for any emotion. Sad? Feed 'em. Happy? Feed 'em! 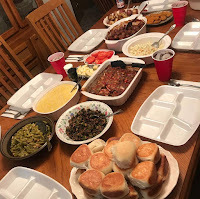 Now I know that this isn't just an Appalachian thing or even just an American thing, but it's a part of MY Appalachia so I decided to write about it. I grew up going to church and being around ladies who were all feeders but I really didn't notice it until my mom passed away. After my Dad had told my brother and I that she had died my Great Aunt Lois arrived at our house to take us to my Granny & Pa's house. It took about 20 minutes for her to get us there. When we walked in the door there was food everywhere. Not only do they cook, they're also quick. News travels fast in small towns and even faster in a Baptist church. When someone is hurting I believe that most people realize that they can't fix it but they find a million different ways to help ease the burden and pain. The women I know do that through food. I don't know if you've noticed but it always tends to be what we call "comfort food." Why? Because they aren't just bringing you a casserole. They're hoping to deliver comfort as well. These meals aren't just for deaths though. Women in my part of Appalachia will plan a meal for people who have been sick, baptisms, and many other occasions. My church has a tradition where we always have a meal after a baptizing as a way of celebrating the occasion. Last Sunday, after a scheduling mix up, we realized that a family had all shown up to see their grandson be baptized and we didn't have a thing to feed 100+ people. I ain't going to lie...I panicked for a minute. Then after talking to my stepmom, we agreed that we could call in a pizza order after Sunday school. We called as soon as they opened (11AM). "Sorry, ma'am. We need at least a 2 day notice for anything over 20 pizzas." PANIC. My stepmom and I flew down the highway heading for town and called a local sandwich shop. "Sorry, there's no way we can have that many sandwiches ready by 12:30." PANIC. We called a local grocery store deli to see if they could help us out. NOPE. After collecting myself and praying to the good Lord that He'd disable any hardworking law enforcement's speed tracking devices, I shouted, "We can make soup and sandwiches!!" At this point, it's 11:30ish and we still have to run into Walmart to buy the food and drinks, drive the 15-20 minutes back to the church, and get it all set up. Fix it, Jesus. I called my husband and prayed that the Lord would forgive him for answering his phone during preaching. He plays the banjo in the church band so I told him that we couldn't get the pizzas but we were figuring it out and to play lots of music...and STALL! We tore through Walmart like our pants were on fire. We ended up buying pre-made subs from the deli, condiments, soup mix, chips, cookies, and drinks. Beggars can't be choosers. By some miraculous heavenly intervention, we didn't have to wait long in line to check out. We arrived back at the church at around 12, unloaded my car, sliced up sandwiches and filled up trays, made two huge pots of soup, put out the chips and cookies, filled up cups with ice, and had it all done by 12:30. I asked the Lord to bless our humble meal like he did the loaves and fishes and that's about the time we heard music and people started to trickle in. Like I said, I come from a long line of feeders. And that's a good thing because I also like to eat. 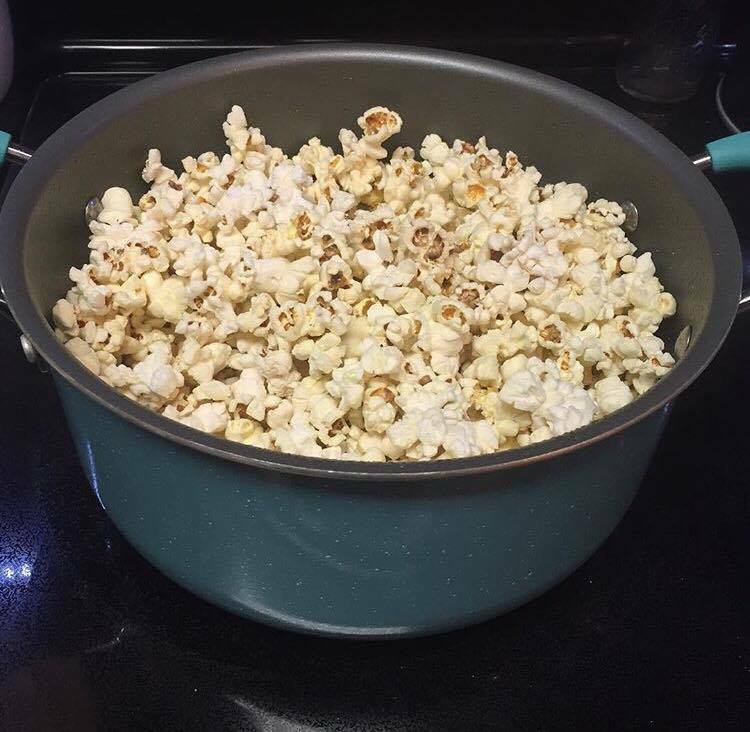 I married into a family of feeders. Just about every Saturday evening my little family & my brother-in-law and his family have supper at my husband's parent's house. 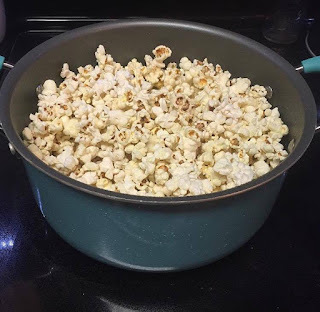 My mother-in-law does it so we can all spend time together. I look forward to it every week. A typical Saturday spread. My mother in-law is a professional feeder. 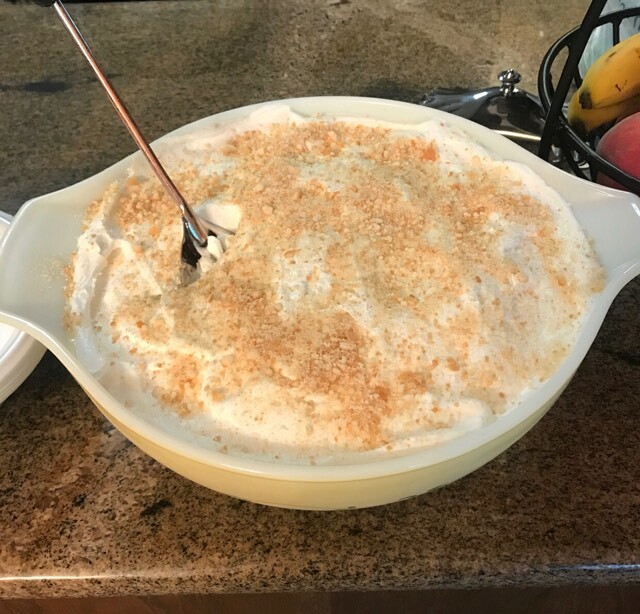 As if all of that food wasn't enough, she went and made a nanner puddin'! 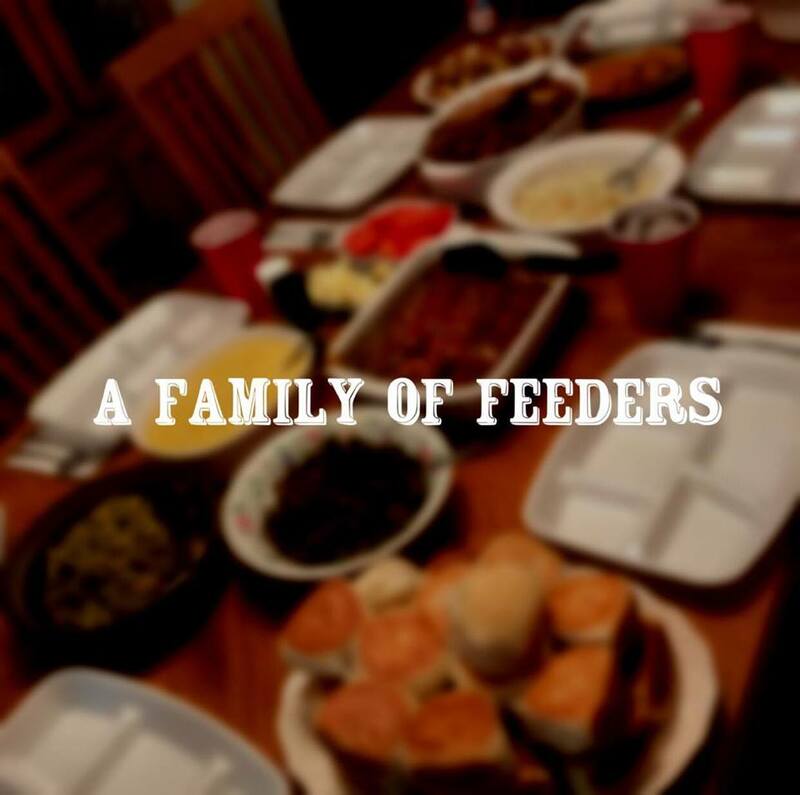 Are you a feeder or happen to come from a family of feeders too? I'd love to hear from you! You can either leave a comment below or in the comment section on this post on Facebook. I really do read them all! I realize that it's been several months since my last blog post. I enjoy writing but I'm not always able to find the time or sometimes even the desire to write. Life is hard sometimes. I'd like to thank all you faithful readers for sticking around and continuing to follow the Appalachian Mountain Roots Facebook page. I do try to post a quick snapshot of what is going on in my world at the moment or an interesting article over there to keep it active. It ain't much but the page continues to grow. Thank you. I hope to sit aside time each week to write now that the garden is petering out and we're back in our homeschooling routine. I enjoy writing and sharing a bit of my life and love of Appalachia and I thank y'all for being kind enough to read it!